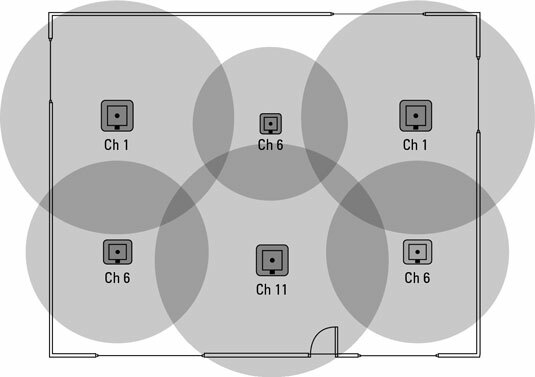 The process of developing a wireless network becomes complex when you are deploying multiple APs throughout a multi-story building, because in addition to your neighbors Access Points (APs) you need to worry about location, channel selection, and interference from your old APs with each other. You have only three channels to work with in North America when dealing with 2.4 GHz networking. Some people have suggested that you can get away setting up your channels in a four-channel manner by using channels 1, 4, 8, and 11. This setup would give you overlap in the shoulder area of the bands, but the overlap would be fairly small. Cisco has done lab testing of the concept using four APs and four clients all transferring 50MB files to and from a server. Even with this limited overlap, data ends up being lost, and stations or computers wait their mandatory wait periods and retransmit data. These problems slow down the overall throughput. The following table shows the final results. So if you are told that you can use four channels when making your channel selections, this is not advisable and you should stick to the reliable and time tested three channel configuration. The simplest wireless network contains only one AP and that the issues that you need to deal with for one AP are generally placement and signal loss. 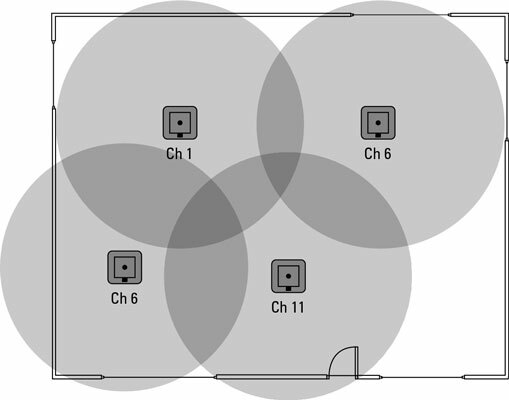 A centrally located AP in an office with a few obstructions that may cause signal loss in the unshaded areas. In addition to the obstructions and construction material, there may be various sources of external interference that can reduce the size of the coverage area. Ignoring signal loss from building materials, if you have three APs in your layout and no outside interference, you should use all three of the non-overlapping channels (1, 6, and 11). The only exception to this would be if you had a more linear layout, where the APs at either end of the line were isolated by the middle AP. A typical pattern may give you a layout that resembles what is shown. Cisco recommends a 10–15 percent overlap between APs to allow complete coverage in the interim area, 15–20 percent for VOIP solutions. This deployment would be more complex if you had to provide coverage using four APs. In that case, you would have to reuse at least one of the non-overlapping channels to complete the deployment. You can do that by isolating the AP with the reused channel from the other AP (which is using the same channel) by having stronger signals from the intermediary APs separate them. Staggering these AP channels allows you to provide coverage on all your network APs. An example of this is shown, where the two APs on channel 6 are separated by the combined signals from the APs on channels 1 and 11. An AP on channel 6 separates the two channel 1 APs, allowing that channel to be reused. All three channel 6 APs are primarily separated by the channel 11 AP. 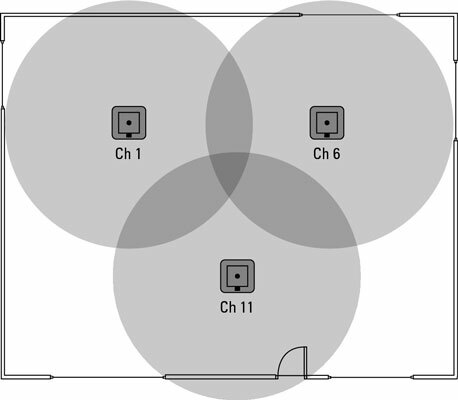 In addition to the physical placement, the power levels on the channel 6 APs have been reduced to provide a lower radius of coverage, thus preventing these APs from touching each other. Having been involved in some large wireless rollouts, channel selection gets even more complicated when you have to do this type of RF management across a three-story building. 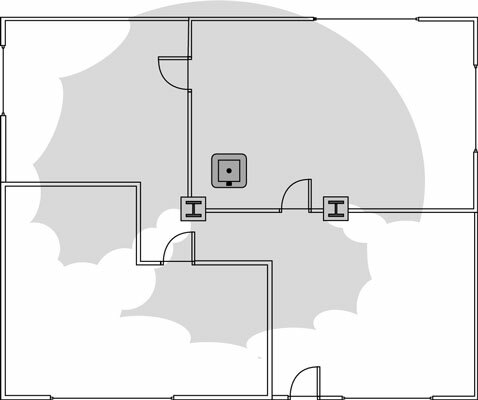 In that case, you have to keep your channels separated not only per floor but also between floors. Some APs on the market support automatic tuning of channel numbers and signal strength, where the APs on the network identify each other and adjust their radio channels and signal strength to provide optimal coverage, even with APs from other organizations in close proximity. In challenging environments, you may need to actively manage your APs radio settings. Systems such as Cisco’s Wireless LAN Controller, which knows about all internal network APs and can detect external APs, give you a good option for automatic tuning of channels and signal strength. In automatic tuning, each AP goes off-channel for a short period of time to allow the AP to scan all channels to look for interference. Going off-channel means that there is a brief period when it ignores the wireless client devices that are connected to it, and does its scan of the other channels. This interruption is very brief, so the wireless clients will not be affected, other than a slight decrease in overall throughput. Because the Wireless LAN Controller also knows about all other APs that exist on the network, it can determine the strength and visibility of the surrounding APs. Knowing the strength and visibility of both its own APs and surrounding APs allows the WLC to recalculate the channel selection and radio strength of all APs on the network, thereby optimizing coverage over the whole network.